The Bourier Property is composed of one block totaling 228 claims covering an area of 11,579 ha for some 30 kilometers in length. It is located just along the east side of the new Rupert hydroelectric complex. The Bourier project offers strong lithium potential in a well-established area. The lithium pegmatites tend to occur in swarms in the volcano-sedimentary units. 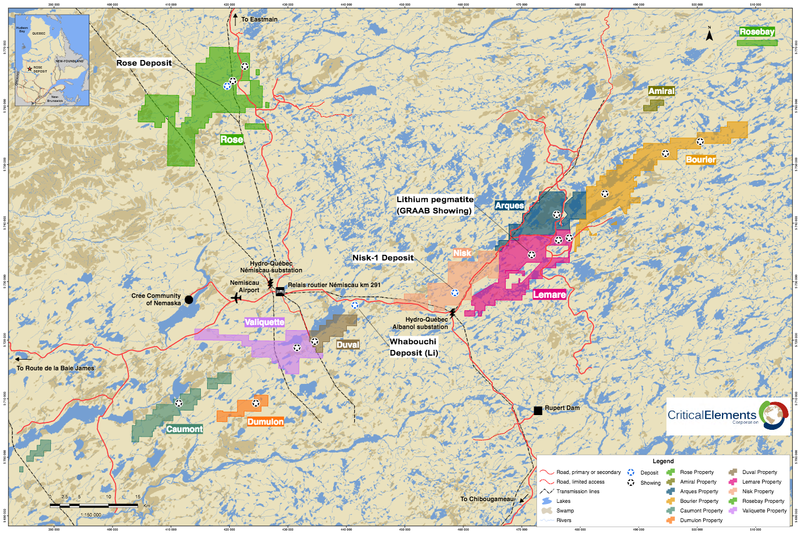 The Bourier property covers a large part of the regional volcano-sedimentary unit, a favourable unit that hosts Nemaska Lithium's Wabouchi deposit and the Lemarre showing. The Lac des Montagnes volcano-sedimentary formation crosses the Bourier Property in a NE direction. It is composed of paragneiss, amphibolites and granitic intrusions. To the North of the Lac des Montagnes Formation, mainly orthogneiss formed of metamorphosed granite has been observed, while the South area of this formation is composed mainly of paragneiss, also intruded by granites. In the Bourier Lake area, what has been identified as an exhalative massive sulphide horizon in felsic rocks was discovered during fieldwork conducted North of Bourier Lake in summer 2010 and 2011. Soil samples taken over an 8 km strike length of this horizon returned anomalous values for Ni, Cu, Zn and Pb. Some channel samples and other grab samples returned anomalous values for Au, As, Ni and Cu. This exhalative horizon in felsic rocks is now known to extend for more than 25 km over the property.